Creation: Appeared in Oct 2005 (Kozel post to MTR) as a renumbering of US 29 Business. This is the 3rd VA 163. Ran as it does today. VA 163 was multilaned from US 29 Bus/501 north to US 460 Bus EB and also from Church St across the James River. 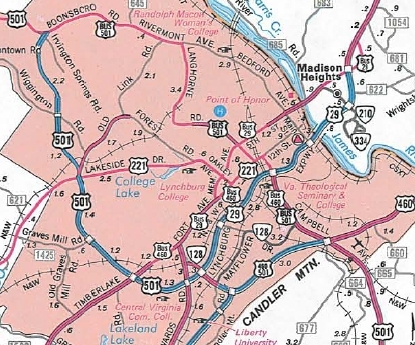 Comment: VA 163 has two intersections with US 29 Bus on its north end - each are half-accesses. 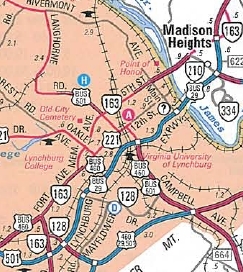 As with Danville, US 29 has now twice-bypassed Lynchburg. I had thought VA 291 would be assigned in this situation but I was erroneous in my thinking. VA 163 #1: Appeared in July 1933 as a renumbering of VA 424, running from US 60 (now SR 631) south to Roxbury Station. 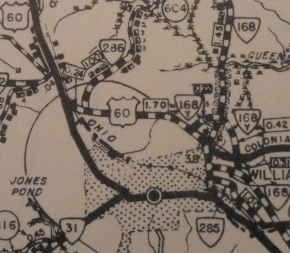 In Sept 1942 (CTB), VA 163 was downgraded to SR 609. Today, the northern half of VA 163 is now part of VA 106. 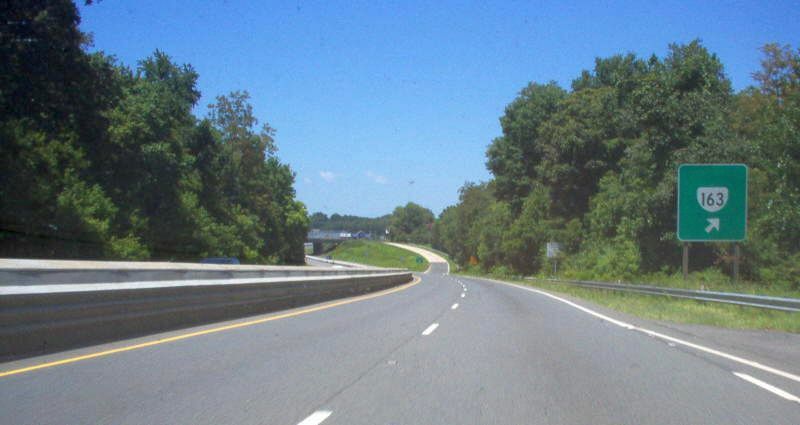 VA 163 cut east on current SR 609 to end where it crosses the RR. VA 163 #2: Appeared in Sept 1945 (CTB) as a renumbering of VA 168-Y. Ran from US 60 around to VA 162 (now just second st) in Williamsburg. 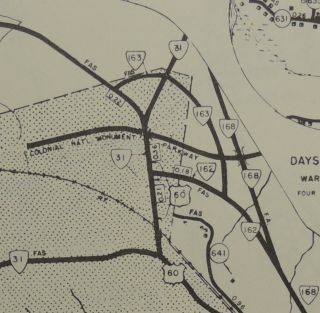 In Aug 1993 (CTB), VA 163 was decommissioned to unnumbered Parkway Dr.
VA 163 provided direct access to the Colonial Pkwy from either VA 5-31 or VA 162. While still active, VA 163 was posted only in cutouts or white border signs.